NYC, 04/18/2019, 7:00PM. Curating Fascism: Exhibiting Art in Collapsing Democracies. 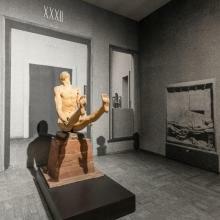 The recent exhibition, Post Zang Tumb Tuum, organized in 2018 by Germano Celant at Fondazione Prada in Milan, elicited admiring reviews. Only a handful of critics noted, however, that the exhibition performed a kind of cultural seduction reminiscent of the Fascist regime itself. Post Zang Tumb Tuum is the third major exhibition in Italy dedicated to fascist art: Carlo Ragghianti’s 1967 Arte Moderna in Italia. 1915-1935, held at Florence’s Palazzo Strozzi and Renato Barilli’s 1982 Anni Trenta: Arte e Cultura in Italia at Milan’s Palazzo Reale. All three exhibitions looked back to the fascist past to interpret current cultural/political changes. This paper considers the Prada Foundation show in light of that history, asking how each exhibition addressed the contradictory complexity of the Fascist art system and the narratives constructed around it in the postwar era. What does the act of showing and concealing the Fascist past reveal about the objectives and anxieties of contemporary public discourse? We will suggest that, like its predecessors, the Prada exhibition aestheticizes Fascism without fully addressing the traumatic experience of living under Mussolini's regime. With Raffaele Bedarida, Cooper Union.